I still make many mistakes in Chinese, and only yesterday managed to confuse a Shanghai taxi driver by asking for the railway station as opposed to a subway station, but I am now generally able to ask Chinese people for help when getting from A to B. I also have a better chance of interpreting their answers, although it has to be said understanding directions remains a challenge (‘direction right go’ is the word order). Yesterday in Shanghai I was looking for Metro Line 10 to get back to the main railway station, having said goodbye to my visitors. The interchange station at South Shaanxi Road is being refurbished and the normal Line 10 entrance was hidden behind hoardings. After walking around bewildered for a few minutes, I overheard a young woman asking a policeman how to get to Line 10 and asked her if I could tag along. She was delighted and we struck up a conversation. She steered me to the station and helped me find the right train to Hongqiao. It turned out she was in the navy and often visited military establishments in Ningbo. Our conversation stumbled occasionally, for example when I didn’t know if she was asking me about the weather or the food in England, but we managed somehow. Emboldened by my success, once on the high speed train back to Ningbo I started chatting to the woman sitting next to me. My initial excuse was to alert her that her mobile was ringing – she couldn’t hear because she was watching a movie on her tablet. She was intrigued that I could speak some Chinese, but at first wanted to speak English and indeed her English was near perfect, with a slight Dutch accent. She was in international trade – import-export – like so many young business people in Ningbo and one of her clients was in Amsterdam. She had perfected her English by going to the Netherlands regularly. After a while she looked at me and said, ‘Ok, now let’s talk in Chinese. It will be good for you.’ I told her a bit about why I had been in Shanghai and what I’d been doing there with my visitors. I explained that they had come back to China after almost 30 years and were astonished by the changes. China had been a rural country back in the mid-1980s – ‘Where are all the bicycles?’ was a constant refrain, in addition to their amazement at the unceasing urban sprawl over the 250 kms between Shanghai and Ningbo. On an unusually clear day, we had ascended the Shanghai World Trade and Financial Centre tower – it famously looks like a bottle opener and has a framed void of about three storeys before you get to the very top floor. You can look out on the Bund, over the full extent of the Shanghai suburbs and to the airport and the Huangpu estuary to the north east, or down through the glass to the streets below – stomach-churning! But already it is dwarfed by a new tower; my friend didn’t know of this and we looked it up on her tablet – it is called the Shanghai Tower. I was able to ascertain that my travelling companion was from the far north east of China, near the Russian border, 10 hours beyond Harbin. She spoke very clear, standard Mandarin was far easier for me to understand as compared to the Ningboese, who are not native Mandarin speakers and have a different accent. Her mother lived with her in Ningbo and helped her and her policeman husband to take care of their daughter, now a teenager. ‘So why did you come to live in Ningbo,’ I asked and her answer was for me the most fascinating part of the conversation. ‘Have you heard of Mao Zedong?’ she answered. I assured I had, although I didn’t mention that I’d spent the afternoon in the wonderful Shanghai Chinese Propaganda Poster Museum, which vividly tells the story of Mao in pictures. Her father had been a victim of Mao’s Cultural Revolution. He had been born in Ningbo in 1955 and had been sent as a ‘zhi qing’ youth to the far north east of Heilongjiang to work on the land. He had met and married a local girl – her mother – and she had been born. But then, as the Cultural Revolution ended, her grandfather had given his son a job back in Ningbo in a bank, and her father had left her aged three and her mother up in the north east. Dad didn’t come back, divorced her mother and remarried. When she was about 10, my companion and her mother had also come to Ningbo, although they didn’t live with her father. My research in Ningbo Zhongshan Park had familiarised me with this history and its consequences, but my new friend was surprised that I understood the context of her experiences. I told her about the ‘zhi qing’ museum I’d discovered outside Ningbo and how many people of her father’s age go to the park to sing Red songs and socialise with others sent off to Heilongjiang. It was all news to her as far as I could tell and not an era she cared to dwell on. I have to admit we had by now lapsed back into English, but I had still had my longest conversation ever in Chinese with someone other than my teacher. As we got off the train at Ningbo, I was euphoric and didn’t mind waiting in the pouring rain for my ride home. We took yet another new highway that has just opened between our flat and the station, and the driver, a Ningbo man, admitted he liked the road but didn’t really know where it went. As the woman on the train and I had agreed, the Chinese always look forward optimistically. As we enter our last few months in China, friends and family have realised that this is their last chance to visit us here and we are experiencing a welcome flurry of visitors. 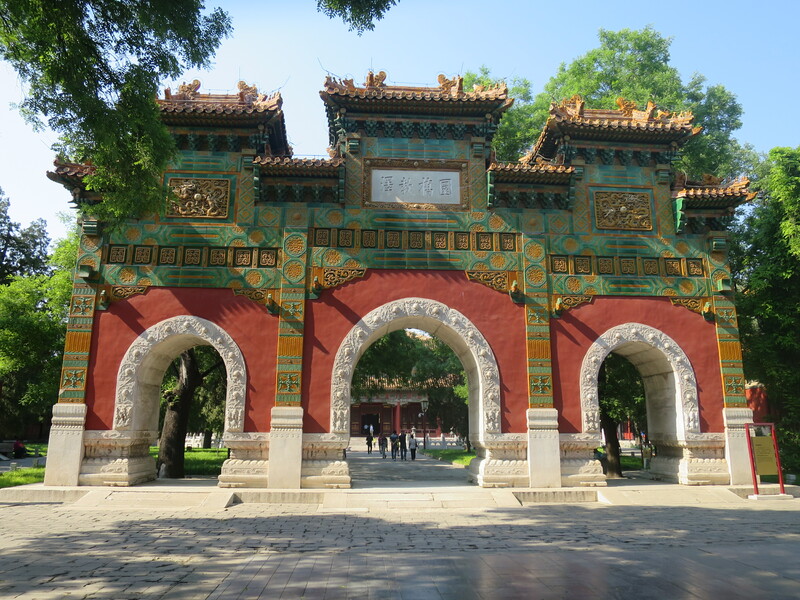 My improved Chinese means that the tour guide skills I can offer have hugely improved since our tentative attempts at travel in our first year. Guests sometimes ask me if it is boring to go back to the same places repeatedly, but I can assure them it is not! Most tourist destinations are so huge that each trip offers something fresh, and in addition, it is gratifying at last to be able to navigate places and get to restaurants and ‘scenic spots’ without difficulty, even showing off a bit of conversation in Mandarin on the way. For example, I’ve been to Hangzhou twice over the last few months; Hangzhou was our first day trip outside Ningbo back in 2012. Since then Ningbo and Hangzhou have become connected by high speed train, both have fancy new stations and Hangzhou has a new metro system. During my first attempt at being a tour guide for friends last September I made the embarrassing mistake of not realising that we’d arrived in a different station and getting us lost on the metro system. This month I was on my mettle and navigated the metro without mishap. The West Lake is the main attraction of Hangzhou (it has been since at least the 12th century) and a circuit of the lake combined with a traditional lunch of beggar’s chicken and/or lake carp makes a good day’s outing. Especially last week, when the sun shone, the temperature rose to 25 degrees or more and the magnolias were in full bloom. Despite the modernisation of the city, elderly locals still gather to dance and to sing opera at the water’s edge. On our return I read a Guardian article by Anne Karpf about how unfriendly modern British cities are for old people, from struggling to cross wide highways to the lack of places for social interaction. It is generally the same in China of course, but here parks and other public spaces like those in Hangzhou at least seem to be more welcoming to the elderly. We accompanied our last pair of visitors to Shanghai, where they were embarking on a grand tour of the country. Although we have been to the city many times, there are still surprises. On our very first visit to Shanghai in June 2012 we were told how single men came to People’s Square to look for a wife, but we hadn’t seen how this ‘would like to meet’ ritual actually took place. Last Sunday afternoon while showing our friends the park, we came across a long path dedicated to this purpose. Hand written, laminated A4 sheets, some with photos, but many without, were laid out on the path, showing the birth year, height, income and general prospects of the hopeful groom, although there were a few hopeful brides as well. Round the corner, people (perhaps parents of unmarried children) sat with more ads, but here they were stuck on top of open umbrellas which formed platforms on the pavement. A man approached me and asked me if I had a daughter. For the first time in China, only having sons seemed a disadvantage! This museum has a huge scale model of the entire urban area of Shanghai and new buildings are added as they are completed. You can walk around it on a raised platform. It occurred to me that this would be a brilliant introduction to the city, helping to orientate visitors and show the layout of the old city, the 19th century concession areas and the Bund, so our visitors finally prompted me to go there. Another floor is dedicated to photos of old and new Shanghai and it is fascinating to see pictures side by side of neighbourhoods in say 1980 and 2004, with low rise tumbledown courtyard houses and people on bicycles transformed into high rise blocks and cars on eight lane highways. It has to be said that the photos are all taken on a sunny, clear day, and the terrible pollution that shrouds Shanghai most of the time is not to be seen! Our next set of visitors will be visiting China for the second time; their previous visit was before ‘reform and opening’ so they will be experiencing the changes recorded in the Shanghai photographs. I’m very interested to find out what they will think of new China.